Living conditions are basic, but comfortable. We are in private rooms, the main building contains the kitchen, dining area five bedrooms and the wash block, and there are nine individual huts around the compound. Beds are all equipped with mosquito nets; their protection against other unwanted guests such as spiders and cockroaches is also appreciated. A water tank provides chlorinated running water for showers and basins. Drinking water is filtered. Electricity comes from a generator, which is switched off at night to conserve fuel. We have WiFi – not the fastest connection, but reliable. Baraka is a large project, the regular team of international staff consists of 10 people. Add to that ‘Flying staff’ like myself, the Watsan, the HIV doctor, lab technician, and mental health officer, or visitors from the coordination team in Bukavu or other projects or the Amsterdam headquarters, and the compound soon becomes crowded. Occasionally, there are not enough bedrooms, and occasionally a visitor sleeps in a tent. There may be 16 or more of us, all sharing the same small living areas, two toilets and three washrooms. These can get congested in the mornings and evenings. 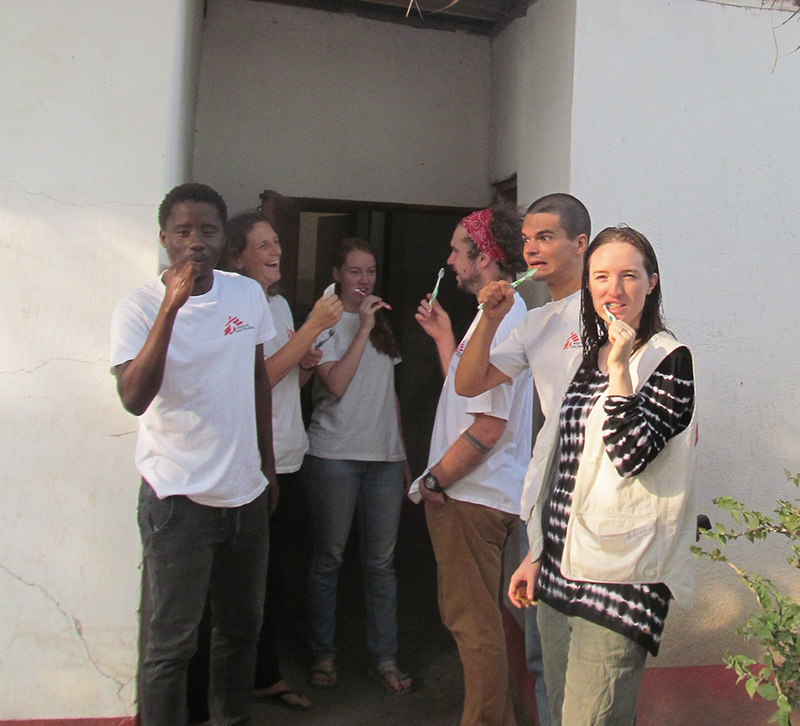 It is not unusual to see several of us standing around the wash block, brushing our teeth. Food is plentiful, and reasonably varied. There are always the African staples – fufu, greens, stewed beef or chicken, or grilled fish and a tomato sauce. There is usually rice, occasionally pasta or couscous, other regulars include a version of lasagna, and a mountain of potato and aubergine with eggs and cheese. Friday evenings we get pizza. Another regular is the Congolese Mexican feast, a wonderfully eclectic selection: chapatis, bean stew, minced beef with onions, rice, salad and guacamole. But the real highlight for the Baraka gourmand is breakfast. Usually, breakfast in MSF is a fend for yourself, eat what you can find affair. Not in Baraka - every day we get pancakes, hard boiled eggs and fresh fruit salad. Or maybe the highlight is the Sunday evening meal – the mamas have a day off on Sundays and we fend for ourselves. Different people volunteer to prepare different dishes. Recent treats include freshly baked rosemary bread and hummus, barbecued goat, baked fish, vegetable curries, kebabs, macaroni cheese, chocolate cake, fruit sorbet….. The working day starts early: 7.30/8, and often work goes on well into the evenings. Spare time can spent sitting with a chatting with the other international staff over a beer. It is always fascinating to talk to people from different parts of the world, with different backgrounds - everyone has interesting stories to tell. Occasionally we watch a film or documentary, some go running, work out, do yoga or play a musical instrument. And there are always emails and the internet. Weekends we are encouraged to stop working, or at least, slow down. People may retreat to their rooms – privacy can be precious. We go for walks around the town, the market, and of course there is Sunday cooking. The heath, security and wellbeing of international staff is important to MSF, and we are obliged to take a holiday every three months or so – for DRC missions and other countries where security may be an issue, we have to leave the country for this break. MSF life is definitely not five star luxury, but it is never dull, and if you embrace the experience and the diversity, it is always rewarding.